American Pancake: Father John Misty's - "Holy Sh+t" on Stephen Colbert Proves that Father John has to be Seen to be Heard. Father John Misty's - "Holy Sh+t" on Stephen Colbert Proves that Father John has to be Seen to be Heard. 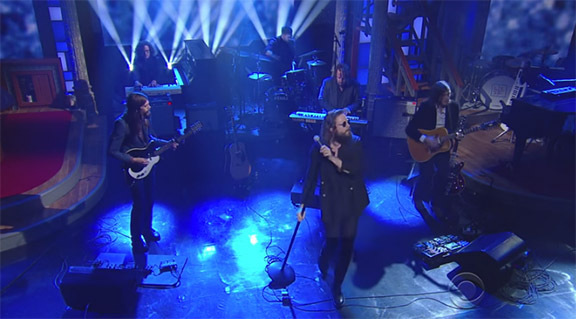 Father John Misty has been making the rounds on late night TV to promote the album, "I Love You Honey Bear"and on Stephen Colbert performed Holy Sh+T. Now Father John is recycling his own melodies a bit but who really cares. His aesthetic of bitter social commentary via the indie folk ballad is captivating and the almost Church chorale meets anthem rock dramatics of Holy Sh+t feels right. I have not had the pleasure of seeing Father John Misty live but he is one of those artists who believe in the performance of his art and every time I see him perform live in the media it is clear that Father John Misty has to be seen to be heard.